PARTY PACK - 24 pack variety ensures everyone gets a hat! Parties, fun events, and anything in between, you don't want to miss getting your yellow hat! SOFT PLASTIC - The soft plastic ensures a safe TOY to be used by kids for ages 5 and up. Fashionable and enjoyable to lighten up the party! GOODY BAGS - These are perfect to throw in small goody bags at kids parties! Children will love being able to pretend being a construction worker! QUALITY - Provided to you from Anapoliz Brand, you know you're getting quality product that will last during the life of the party. Beware of similar ones that can't live up to our quality! FUN - It's a yellow hat! What isn't awesome about being able to show one off at your event? PARTY PACK - 24 pack variety ensures everyone gets a hat! Parties, fun events, and anything in between, you don't want to miss getting your yellow hat! SOFT PLASTIC - The soft plastic ensures a safe TOY to be used by kids for ages 5 and up. Fashionable and enjoyable to lighten up the party! 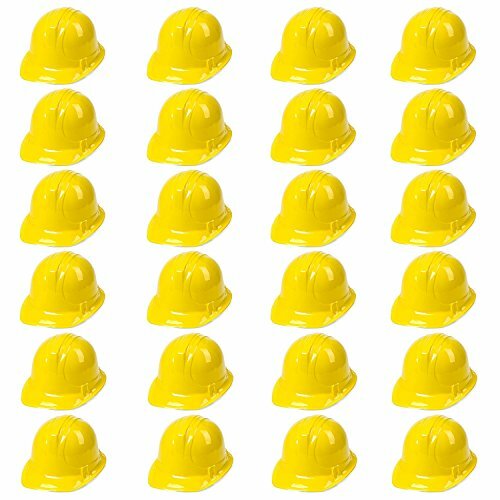 THEME PARTY - These are perfect to throw on and Children will love being able to pretend they're a construction worker! QUALITY - Provided to you from Anapoliz Brand, you know you're getting quality product that will last during the life of the party. Beware of similar ones that can't live up to our quality! FUN - It's a yellow hat! What isn't awesome about being able to show one off at your event? If you have any questions about this product by Anapoliz, contact us by completing and submitting the form below. If you are looking for a specif part number, please include it with your message.